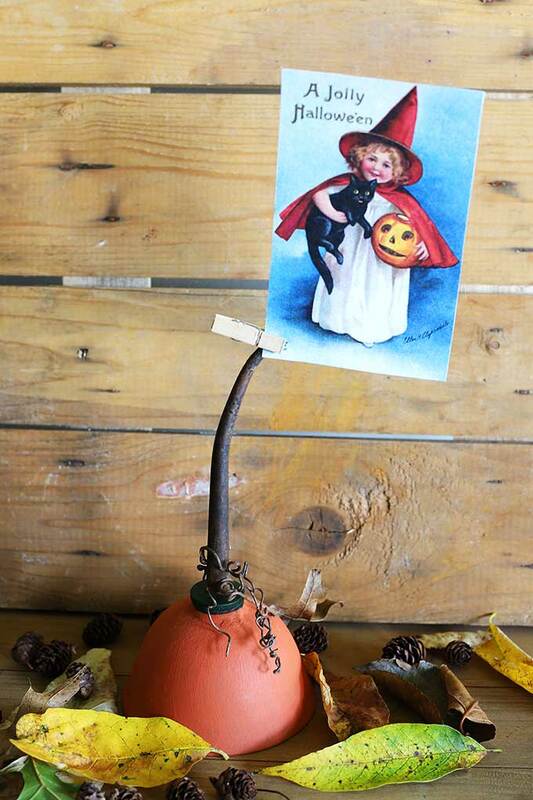 A repurposed oil can makes for a fun pumpkin photo holder for fall. 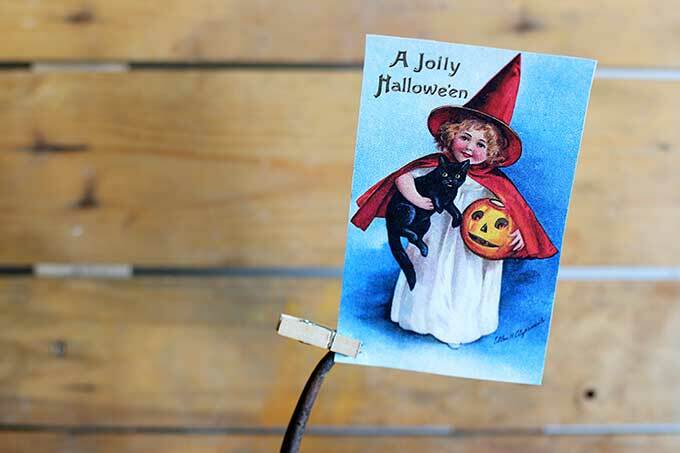 A QUICK and EASY fall DIY project with vintage Halloween printable image included. 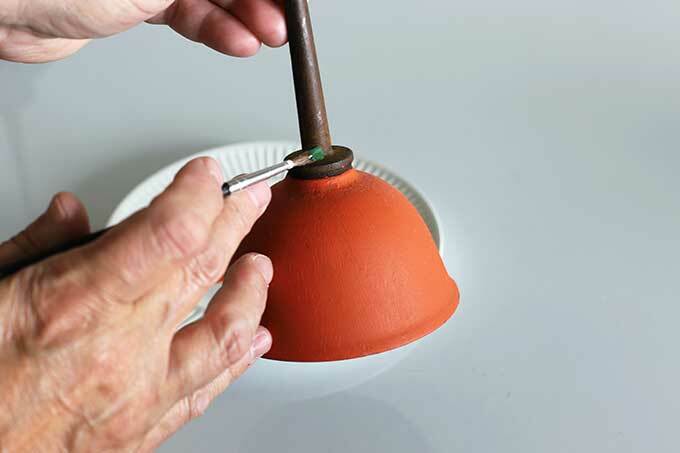 When I ran across some rusty oil cans at a local estate sale recently, I immediately knew what I wanted to make with one of them. 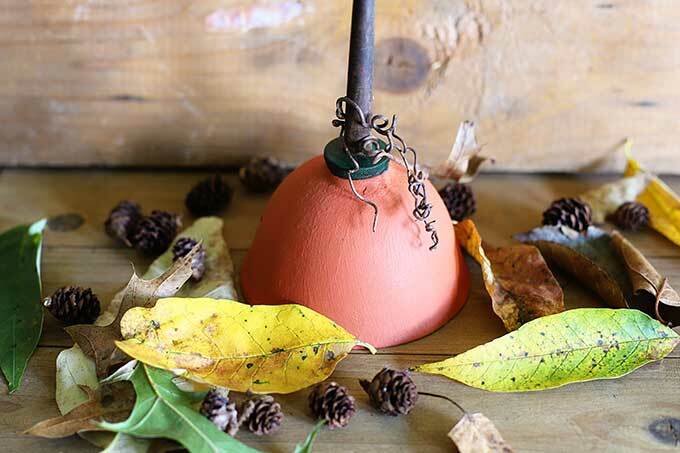 A pumpkin photo holder for fall. Or in this case, a super cute vintage postcard holder. Did you think that was a photo of me from childhood? Nope, that’s actually a copy of a vintage postcard that I scanned. I don’t know about you, but I love a good vintage postcard image and love when I have a cute place to display them. Back in the spring I showed you how I displayed some vintage Easter postcards very simply. And this idea is almost as simple! Simple is my middle name. No comments from the peanut gallery. Wash the grease off the oil can with soapy water and a rag you never want to use again. Cut some curly things from a grapevine wreath and wrap it around the top. You could also use twine or faux fall leaves if you’d like. Finish it off by attaching a vintage postcard image to it with a mini clothespin. 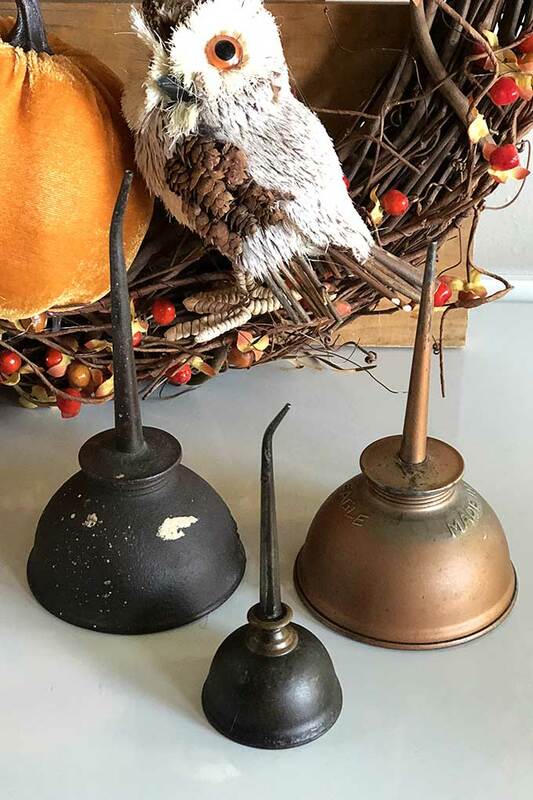 If you want to make your own repurposed oil can pumpkin photo holder, you can either use one of your own photos (kids, grandkids or pets decked out in their Halloween costumes would do nicely) or print out my little witch girl. Tip: Rather than using the actual postcard for crafting, I normally scan them and print them out. This original postcard made it through 109 years without too much wear and tear, I’d hate to think my klutzy self is the reason it gets ruined NOW! She might put a spell on me if I did that! You can either right click the image to print it out or click HERE to find it as a pdf for printing and crafting. 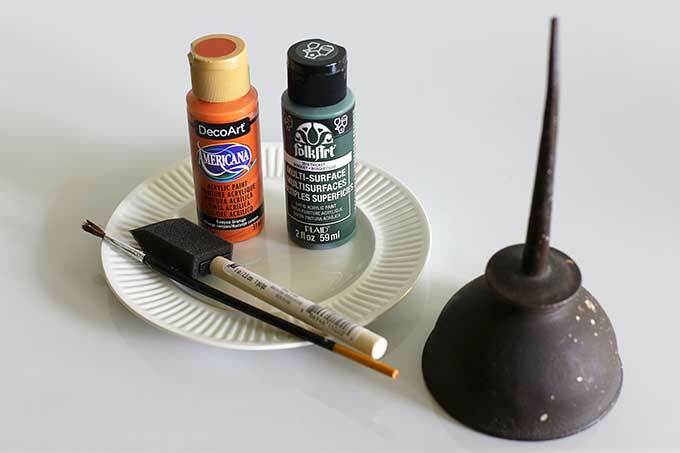 Now run out to your garage, grab an oil can and start painting! 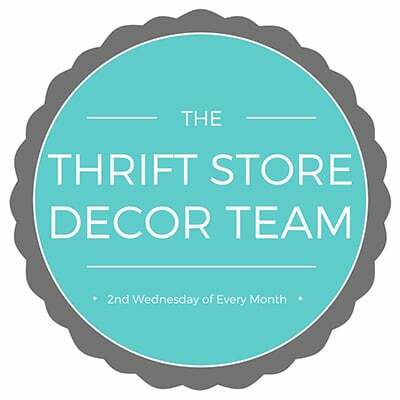 But before you do that, it’s the 2nd Wednesday of the month so it’s Thrift Store Decor Team day! Yay!!! Go on over and see what everyone else has up their sweater covered sleeves this month! Super cute!! I have a few oil cans in my stash…somewhere. Well, now I’m wondering where the heck they are? 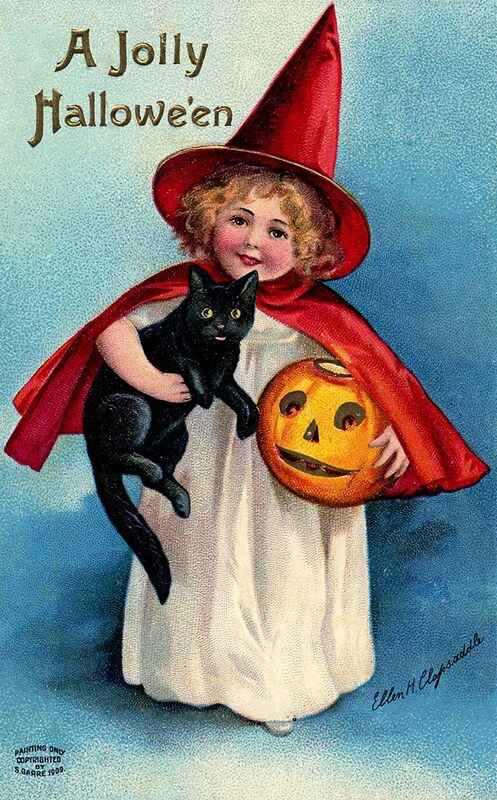 But either way, I have that very same postcard cuz she’s the cutest witch ever! ohhhh, how cute! Not at all what I expected. The vintage oil can turned out soooo adorable. Love the vintage print too! Such a cute idea! And I love the idea for using a mini clothespin! Fun! My advice? 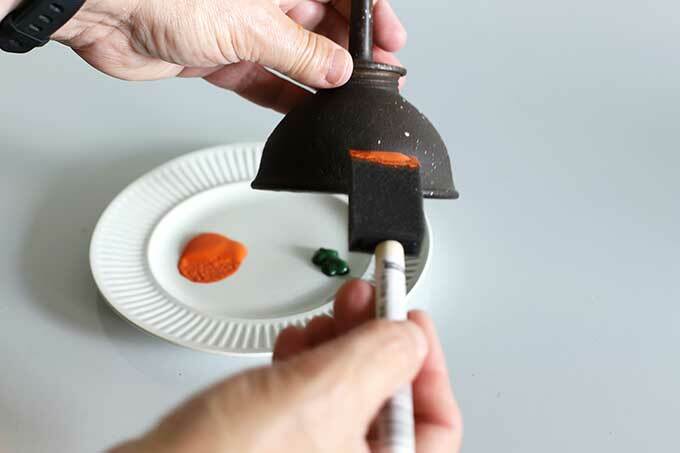 Glue some felt or something on the bottom before you put it on a table! It IS cute, although I think I might just use the oil can as is in its vintage glory- no paint! I never would have thought of this, Pam. It’s really cute. Girl, you’ve gone and done it again! This is such a clever idea!